Curbed: It seems fairly uncontroversial to say that everybody deserves a good living environment. 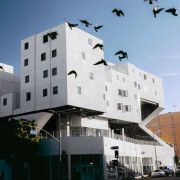 But ask Michael Webb, author of Building Community: New Apartment Architecture, about the state of high-rise design in today’s cities, and he’ll tell you it’s not obvious that designers, and especially developers, have that idea in mind. 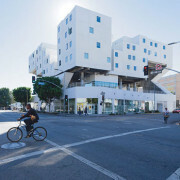 Fast Company Co.Design: Designed by Brooks +Scarpa, The Six offers housing and support services to one of the city’s most vulnerable populations. 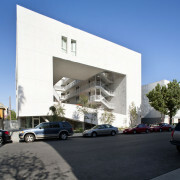 AIA: Eschewing the mold of traditional shelter models by emphasizing group and social spaces, this 42,500-square-foot housing project provides 52 units, support services, and rehab for formerly homeless disabled veterans and individuals in Los Angeles’ MacArthur Park section. 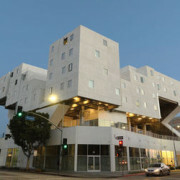 Is prefab the future for affordable housing in Los Angeles? 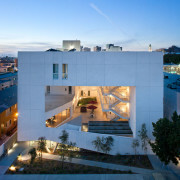 A case from Michael Maltzan Architecture. 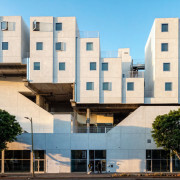 The Architect’s Newspaper: The Star Apartments are Michael Maltzan Architecture’s third project for the Skid Row Housing Trust in downtown Los Angeles. 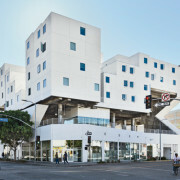 In contrast to the firm’s 2009 New Carver Apartments—a sleek white cylinder with sharply faceted bays—Star is a rough-edged, asymmetrical stack of prefabricated units rising from an existing single-story podium of retail spaces. 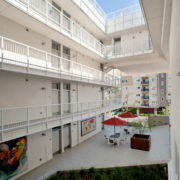 The not-for-profit Skid Row Housing Trust (SRHT) and architect Michael Maltzan are continuing their longstanding partnership through a new development in the San Fernando Valley. Harvard Magazine covers Michael Maltzan and public interest architecture. 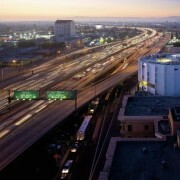 Creative States covers Fast Company article on Michael Maltzan.